The Arabian horse is almost iconic, who could not adnmire it's beauty, spirit and endurance? Many thanks to Philip Wiskell for this article on a most lovely breed of horse. The Arabian horse, also known as "Al Khamsa" in Arabic, is a unique breed because it does not exist as a result of selective breeding with other breeds, but as a breed that stands alone and has been cherished for its purity for thousands of years. Arabians are thought to be the oldest breed in the world, dating back at least 5000 years. The Bedouin tribes who lived in the deserts of the Middle East believed the horses were a gift from God and that they could "fly without wings". They bred them for centuries and breeding was done carefully to create horses that could withstand extreme conditions of the Arabian Desert and tribal wars. Arabians were bred with a large lung capacity, incredible endurance and superior stamina and courage as well as speed and agility. This unique breed has had a distinctive national identity throughout recorded history and is an original breed that many other breeds owe their ancestry to. However, there is controversy as to just where the Arab originated and its history is full of romance, legend, complexity and contradictions. One thing we do know is that the original Arabian horse was somewhat smaller than today's specimens. Otherwise the horse has essentially remained unchanged throughout the centuries. The Bedouins valued purity and many tribes owned only one main strain of horse. The five basic families of the breed include Kehilan, Seglawi, Abeyan, Hamdani and Hadban. Other, less "choice" strains include Maneghi, Jilfan, Shuwayman, and Dahman. Substrains developed in each main strain which were named after a celebrated mare or Sheik that formed a substantial branch within the main strain. Each strain developed characteristics that could be recognized and identified when bred pure. The Kehilan strain was noted for depth of chest, masculine power and size and stood up to 15 hands. The heads were short with broad foreheads and great width in the jowls and were most commonly gray and chestnut. The Seglawi was known for refinement and almost feminine elegance. They were likely to be fast rather than have endurance and had fine boning, longer faces and longer necks than the Kehilan. The average height is 14.2 hands and usually Bay in color. The Abeyan strain is very similar to the Seglawi and tended to be refined. They had a longer back than a typical Arabian, but were small horses, rarely taller than 14.2 hands. They were usually gray and carried more white markings than other strains. Hamdani horses were considered plain with athletic, almost masculine, large boning. The heads were straight in profile, lacking an extreme Jibbah. It was one of the largest, standing as much as 15.2 hands and commonly gray or bay in color. The Hadban strain was a smaller version of the Hamdani but sharing big bones and muscular build. They also possessed an extremely gentle nature. The average height of a Hadban was 14.3 hands and the primary color was brown or bay with few, if any, white markings. In the 17th century, the Turkish rulers of the Ottoman Empire began to send gifts of Arabian horses to European heads of state. Such was the nature of the Godolphin Arabian (sometimes called "Barb") who was imported to England in 1730 as well as the Byerley Turk (1683) and the Darley Arabian (1703). These three "Eastern" stallions formed the foundation upon which a new breed, the Thoroughbred, was to be built and now 93% of all modern Thoroughbreds can be traced to these three stallions. For centuries, Arabians have been used to improve and refine many different breeds of horses either by direct infusion or through the blood of the Thoroughbred. In other words, the Arabian has contributed to some degree, either directly or indirectly, to the formation of virtually all the modern breeds of horses. In fact, the Arabian, as the original racehorse, is becoming more and more popular competing at racetracks throughout the United States. They race distances similar to Thoroughbreds and there are more than 700 all-Arabian races every year. As an endurance horse, the Arabian has no equal. In 1908, the Arabian Horse Club of America was formed and the first stud book was published. 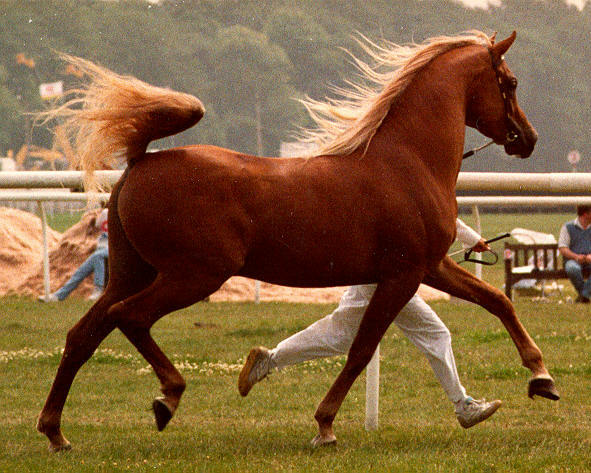 Recognition of the Arabian stud book by the U.S. Department of Agriculture established it as a national registry and the only one for the purebred Arabian breed. At that time, 71 purebred Arabians were registered in what is currently known as the Arabian Horse Association. Now there are more living Arabian horses in the United States than in all the other countries in the world combined and many breeders strongly support naming Arabian horses with traditional Arabian names, which to them, is as important as maintaining breed purity. In terms of temperament, The Arabian is one of the 5 "hot-blooded" horses, which means they have more sensitivity and energy. This sensitivity has manifested itself in an interesting way. You see, the severe climate required the nomads to share food and water and they sometimes even shared their tents with their horses. As a result of being such a close companion, Arabians developed a gentle, pleasant personality and a close affinity to man with a unique ability to bond with their owners. An Arabian will take care of its owner as no other horse will. It has a loyal and willing nature that is unparalleled by any other breed. Foals, for example, have no fear of man, and are usually indifferent to sudden noises. 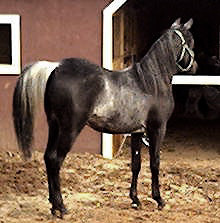 The Arabian gentleness and tractability, while originally the effect of education, is now inherited, and is observed in foals bred in a foreign environment. Today 's Arabian will never be mistaken for another breed of horse because of their distinctive dished profile on a wide forehead and large, wide-set eyes, small muzzle, small, curved ears and large, efficient nostrils. They have a graceful, arched neck, and a broad chest with a strong short back and are fine to medium boned. Arabians have a high, proud tail carriage. These horses weigh between 800 and 1,000 pounds, stand 14.1 to 15.2 hands high, and are usually grey, bay, chestnut, black or roan in color. They are an extremely sound breed, also. Arabians have several unique genetic characteristics. They have 17 ribs, unlike other breeds which usually have 18. They also have one less lumbar vertebra and one less tail bone than other equines, and their skin is always black no matter what their coat color is. Unfortunately they also have many disturbing genetic Diseases and Disorders such as Cerebellar Abiotrophy (CA) where balance and coordination are affected; Guttural Pouch Tympany (GPT), a defect that can be corrected by surgery; Juvenile Epilepsy Syndrome (JES) that is treatable by medication; Lavender Foal Syndrome (LFS)/ Coat Color Dilution Lethal (CCDL) rare, but results in euthanasia of the foal; Occipitoatlantoaxial Malformation (OAAM) where the cervical vertebrae fuse together in the neck and skull causing injury to the spinal cord; and Severe Combined Immunodeficiency (SCID) which is the only genetic condition that can be tested for. The traits that were bred into the Arabian since ancient times has created a versatile horse that is not only a beautiful, loyal breed, but one that excels at being an all-around family horse, show horse, competitive sport horse, race horse, and work horse. Philipe Wiskell is a writer for HorseClicks.com, popular classifieds of horses for sale that include a lot of Arabian Horses for sale.